Perfectly located in the Hepburn Shire Golden Triangle. Springmount is only 15 minutes from Daylesford, Ballarat and Clunes. And only a 5 minute drive to the gorgeous historic town of Creswick. 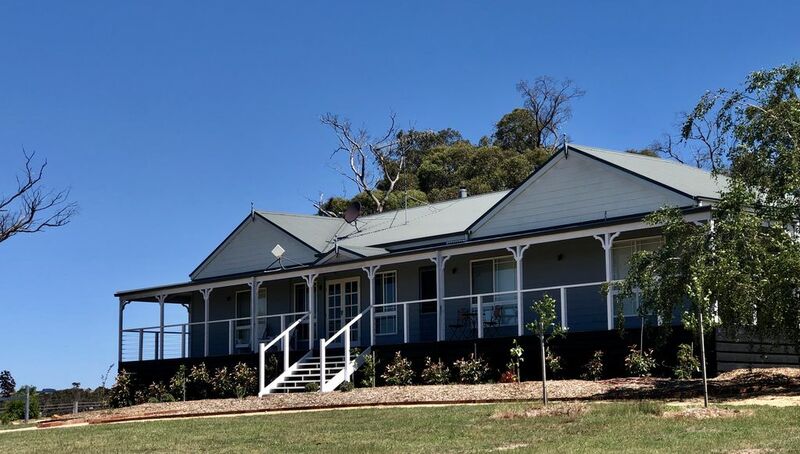 If you are longing for that true wind down get away experience that only country life can offer, look no further than this gorgeous country home set high amongst Springmount's most beautiful valleys. The Cozy Fox, is just that. A beautifully and elegantly decorated homestead with all the comforts of home showcasing exceptionally breathtaking views from every window. Set amongst 25 acres, The Cozy Fox is the perfect indulgent weekend escape, a romantic weekend or family and friends getaway. The Cozy Fox truly gives you that country farmstay experience without compromising on elegance and comfort, which is why it is a premier partner for an outstanding property. With horses to pat and boadering onto the Wombat State Forest, on your door step are the famous Goldfields Walking Tracks which can be explored by foot or bike. You may even be greeted by a family of kangaroos, laughing kookaburras, cockatoos or blue wrens. Boasting stunning views that are just breath taking! With a sleeping configuration that comfortably sleeps up to 10 guests, the Cozy Fox's accomodation is ideal for extended families. Boasting acreages for the kids to explore, the kids will be entertained for hours. There's also a "kids only" entertainment room which provides a nice retreat for kids to escape and relax or just curl up with a good book in the cosy reading room. Relax in front of the wood log fire and soak up the ambiance of this idyllic country escape. If you are not staying in and cooking in the fully equiped kitchen, you are only minutes away from all of the delights that the Hepburn Shire has to offer. Perfectly located in the spa country triangle, the gorgeous historic town of Creswick is only 5 minutes away. Boasting its own French patisserie, award winning bakery and numerous coffee shops and cafes, you can quite easily spend an afternoon exploring all of the historic sites that this quintessential town has to offer. Located only 15 mins from Ballarat and the historic township of Clunes. Daylesford's famous attractions and Hepburn mineral Springs are only a short 15 minute drive away as well. Historical towns, cafes, shopping, golf courses, grass tennis courts, lakes, swimming and walking tracks are all at your door minutes away! 4th bedroom - single bunk beds with walk in robe. Multiple living zones, kids entertainment room, wrap around veranda, breath taking views across the Hepburn Shire, 15 acres. Heating/ aircon, fans in each bedroom, wood fire, dishwasher, coffee machine Nespresso - initial supply pods provided, starter supply of tea/ sugar/milk, BBQ, washing machine/ powder, Hairdryer, electric blankets. 🌲All WOOD FIRE provided for your stay! 🌲ALL LINEN AND BEDDING INCLUDING ONE TOWEL PER GUEST (this is included in the price). Guests cannot provide their own linen as this is the only way we can ensure that the bed provided to you is hygienic. 🌲Coffee pod stater kit, 1 liter full milk, tea ( black and herbal) coffee and sugar. For the comfort and respect of our neighbours, we don't accept 'schoolies' or any large party/event. The property is also unsuitable for pets due to our vast wildlife that live on the property. The property is designed for a mixture of children and adults to enjoy. Please come and enjoy our beautiful farm house with all the luxuries of home and be swept of your feet! We are almost fully booked out during the year so please book early to avoid missing out! Great for families, kids loved the horses! Wonderful property with great space for ten people. Had a lovely time exploring the property, Creswick and Clunes. Highly recommend! Myself and 9 other family members very much enjoyed our time at the cozy fox. It was unfortunate that we had to leave as it was truely the loveliest house to have stayed in, with so much to offer with the most stunning views. One family member in particular wishes to bring his family back down from Queensland to stay again. We had a 4 night stay at the cozy fox just recently as my sister was getting married nearby & I can speak for everyone when I say it was a Beautiful place to stay. Everything was there that we needed, the views were amazing, beds were comfy, showers were hot. There was plenty of space for us all to relax in. Just wish we could have stayed an extra day or two to really enjoy the house after the busy days leading up to the wedding were spent getting organised for that. We will be back! We absolutely loved our stay. Our friends and their kids enjoyed it aswell. Will defenetly be back. Thank you Sarah. Lovely property. Perfect for a family getaway. We really enjoyed our time at the Cozy Fox and regretted not booking a longer stay. The views from the property are gorgeous. The kids loved giving the horses a pat and so did the parents. We would love to stay again. Our 2yo boy slept longer than he ever has before which was a huge surprise. Thank you Sarah for being so welcoming.